Upcoming Events Sunday in the Schoolyard! I hope you are finding ways to relax, rejuvenate and reflect as we settle into mid-summer. Our inimitable Head of School, the great John Finley IV, is off on his sabbatical doing just that. We know he misses all of us here in Dorchester, but we are happy he is able to take advantage of this special opportunity. We look forward to welcoming him back to campus in October! In this summertime issue of Always Learning we are thrilled to share what we have been up to since the last days of the school year and the early days of summer. As we prepare for the year ahead, we are eager to welcome our middle school students back to campus where they will encounter much that is new, including a brand new STEM Lab, a new 1000 square foot Greenhouse and sanctuary space, and our first class of Early Learning Center infants. It’s because of you that all of this is happening. The power of your involvement and support ensures that our children and families soar. If you haven’t already toured our new campus which includes our state of the art Early Learning Center and expanded space for Graduate and Family Support, please know that you have an open invitation to visit. Call me anytime at 617.326.0425 ext. 234 or email me at lbritton@epiphanyschool.com to let me know when you want to stop by. Thank you so much for your friendship and happy reading! Our friends at Santander Bank have been invaluable partners in our work. From sponsoring our Annual Spring Gala last April to serving as volunteers preparing dinner with our Cooking and Gardening Club students, they are making a real difference for our school community. They really enjoyed their volunteer experience and are already planning to bring more team members to visit and volunteer this fall. We are grateful to have the support of Santander Bank, and we can't wait to have them back at Epiphany! 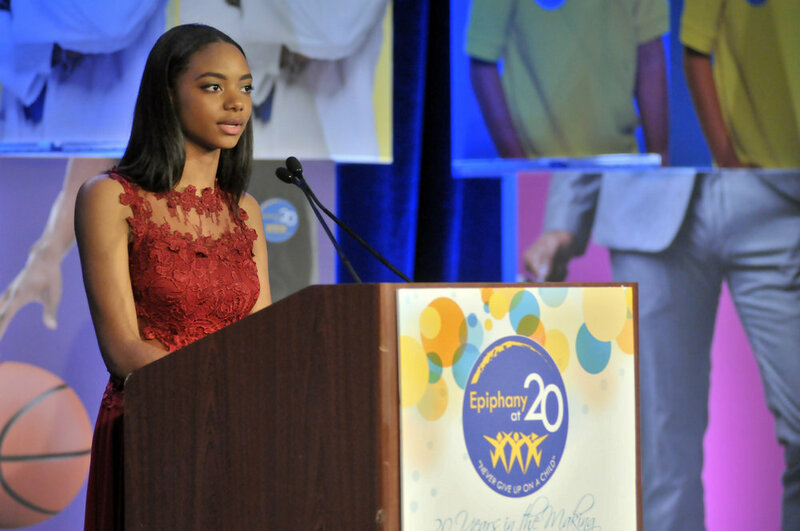 Some of you may know her already from the Gala, where she gave a breathtaking speech about her time at Epiphany. But for those that don’t yet know her, we are thrilled to feature Juliana Barbosa as this month’s Epiphany Star. Juliana graduated from Epiphany in June and will be beginning high school at Beaver Country Day School this fall, where she received a full scholarship! Juliana was born and raised in Boston in a Cape Verdean family and she came to Epiphany in the 5th grade. Juliana describes her first two years at Epiphany as difficult, and she got in trouble frequently due to her behavior. On the last day of 6th grade, Juliana acted out once again, and as a consequence she had to clean the hallways and wasn’t allowed to attend the end-of-year carnival. At that moment, Juliana understood that she needed to change. She was tired of getting in trouble and jeopardizing her future because of her poor choices. During her last two years at Epiphany, her attitude toward her work and teachers shifted for the better. Through the support she received from her teachers, Juliana has been able to overcome her obstacles and she has blossomed into a positive and bright light in our community. Juliana went from getting the most conducts (or detentions) in the school to being one of the top students at Epiphany. Juliana made enormous positive strides at Epiphany and we are sure she will do the same at Beaver Country Day School. We will miss Juliana terribly but we know she will always be part of the Epiphany community. Keep on shining, Juliana! Songwriting/Recording Studio: Students learned to select beats, write lyrics, and record songs in a professional recording studio. Anime Binge: Students watched and discussed themes in anime, compared and contrasted anime from different parts of the globe, and read “manga,” the comic book art form that corresponds to anime. By the end of the week, they used the techniques they learned to create their own manga. Math & Science in Our Community: This project took students into the workplace to learn about different jobs and careers in S.T.E.M. (Science, Technology, Engineering, Math). High School Tours: Students visited high schools in the Boston area and met with Epiphany graduates who attend those schools. Students thought about their own expectations and set goals for high school. College Tours: This project gave students the opportunity to think a few years into the future. They discussed the kind of college they would like to attend, what they would enjoy studying, the process for college acceptance, and what they can start doing now to achieve their goals. Students visited local colleges to explore their interests and begin thinking about their academic futures. A Walk in the Woods: Students traveled to the Boston Nature Center, Arnold Arboretum, and other locations in and around Boston to explore and observe the natural world in our city. They also went whale watching in Boston Harbor! Engineering Slime: This group learned how engineers design and test a product through one of our students’ favorite materials: slime! Students designed slime with different ingredients, textures, and colors and tested and re-tested their products to reach their ideal slime formula! We love seeing the kids have fun by exploring different activities through their projects! This school year ended with an incredibly exciting surprise: we were selected by the Boston Celtics to receive a $50,000 renovation of our Science Lab into a fully functional STEM Lab. STEM stands for Science, Technology, Engineering, and Mathematics, and the new lab is outfitted with the most up-to-date learning technology, including 3-D printers, laser cutters, iPads, and Chromebooks. We celebrated the opening of our new lab with the Celtics in June, and we are so grateful for their extraordinary support. Click here to view the new STEM Lab. Graduating 8th Graders go to Washington, D.C. While our younger students were busy with Project Week, our 8th graders took a 5-day field trip to Washington, D.C. They explored our nation’s capital, visiting museums, national monuments and several universities. They met Senator Elizabeth Warren, and were lucky to have a second meeting with Congressman Joe Kennedy III, who visited Epiphany in May. Thank you to all of the teachers that make our D.C. trip such a success year after year! Unique, Malayah, Ajanae and Sahmir taking over D.C. Thanks to the generosity of two of our wonderful supporters, our rising 8th graders took a trip to Hurricane Island in Maine's Penobscot Bay. They spent five days and four nights immersed in outdoor education, free from cell phones and the heat and noise of the city. On the island students develop their appreciation for nature and the natural world through a variety of activities. They spent time in and on the water and took hikes along the seashore to learn about nature, sustainability, and the flora and fauna that live in and around the island. They explored the intertidal zone and collected lobsters and other animals that live in the island's tidal pools, all while learning about the Maine lobster fishing industry. They also worked on team building activities like rowing and working together to make rafts out of bamboo, plastic jugs, and rope. Traditional camp activities like rock climbing and building a campfire were also a hit with our students. Anayah and Dario jumping into the cold water! On June 16th we celebrated the achievements of the Class of 2018 at Epiphany School’s Annual Graduation. We look forward to staying connected to our new graduates through our Graduate Support Program as we support their success in high school, college and beyond! Beaver Country Day School, Boston Arts Academy, Boston College High School, Boston Collegiate, Cathedral High School, City on a Hill, Codman Academy, Concord-Carlisle High School, Cristo Rey High School, Fenway High School, Milton High School, Rivers School, and Snowden International for Japanese. To prevent summer learning loss, our 6th through 8th graders spend part of each summer at our residential “Summer Intensive” at Groton School. They live in the campus dorms with Epiphany teachers, Teaching Fellows, graduates, and Groton School students serving as their teachers, counselors, and mentors. Students continue their core subjects with daily English and Math classes, and they also take special classes designed for the summer program. This year, they studied Health, Technology, and Media Analysis. There is plenty of play time at the Summer Intensive as well, with over four hours each day dedicated to sports and swimming and a celebratory field trip to Canobie Lake Park at the end of the program. Thank you so much to the staff at the Groton Summer Intensive for making this year a success! Good food for a great cause! Join us on Sunday, September 16 for our 3rd annual Sunday in the Schoolyard foodie event. We are in the midst of planning Sunday in the Schoolyard, which has become one of our favorite events of the year at Epiphany. We are grateful to Ming Tsai and Jody Adams for helping us host this event and for all of the restaurants that donate amazing food for the evening! Among the many restaurants who have joined us over the years, one of the most loyal is Loyal Nine who will be participating for the third time this year! Located in East Cambridge, Loyal Nine is dedicated to serving traditional dishes from New England. They work closely with farmers and artisans to provide the freshest and highest quality organic ingredients. Their meat is humanely raised and their seafood comes from Northeast waters. At Epiphany, we believe in the importance of local farmers and foodways and in educating our students about agriculture and nutrition. As we grow our green education program with our new raised beds and greenhouse, we are so proud to partner with amazing restaurants like Loyal Nine that share our values. In the first year of Sunday in the Schoolyard, Loyal Nine served Beef Tartare with Oyster Aioli and last year they brought the amazing Dressed Tomatoes with Squid Vinaigrette and Toasted Buckwheat. Both were delicious. We hope you will join us for Sunday in the Schoolyard this year to try their offerings at this year’s event, and please make sure to visit them in Cambridge! Thank you Loyal Nine for your incredible support of our school, students, and families.